Édouard Balladur took the leadership of the French Government in March 1993, after a long career in civil service and, beginning in 1986, in politics. After an unsuccessful bid for the presidency in 1995, Balladur retired from the public spotlight. Edouard Balladur became premier (prime minister) of the French Government in March 1993. After his election he distinguished himself perhaps more for his highly unusual popularity in the midst of deep economic crisis than for the solutions he attempted for France's economic woes. Balladur became premier after conservative parties, including his own Gaullist Rally for the Republic (RPR), inflicted a resounding election defeat on the incumbent Socialists. As a result, Socialist President Francois Mitterrand found himself compelled, for the second time in his presidential career, to appoint a head of government from an adversary party. However, due to Balladur's conciliatory posture and personality, this second episode in cohabitation proved far less controversial than the previous one in 1986-1988 (with Jacques Chirac). Balladur was described as a somewhat distant and haughty man of great poise, always elegant in manner, speech, and dress, yet endowed with a wry sense of humor. His personality apparently aided his relationship with the French president, but it cannot alone explain such success. Balladur's own political moderation was at the core of the relationship between president and premier. When the conservatives swept the elections, many commentators and pundits in Europe feared a sharp right-wing political turn in France. Yet, Balladur proved them wrong time and again. While a staunch advocate of free-market economics, Balladur raised taxes in order to reduce a staggering budget deficit and promised to curtail the 10 to 11 percent unemployment rate. Even before his election he pointed out that the French economy was at its worst since the end of World War II and that the French public should not expect miraculous solutions to the crisis. Progress would come slowly and painfully. Balladur also pledged to do the following: keep the French franc as strong as his Socialist predecessors had; strengthen the process of European economic and political integration as much as possible; and privatize a number of state-owned enterprises. With the first two proposals Balladur was sure to appease Mitterrand, and with the latter his own conservative supporters and party allies. Balladur's political and managerial abilities developed over a long period of time during which he stood out of the limelight. Born in 1929 in Smyrna, Turkey, into a French family, he was brought up in Marseilles in southern France. He attended the two top series of courses for future civil servants, the Faculty of Political Sciences and the National School of Administration (ENA) in Paris. After graduation, in the 1960s and 1970s he worked for Gaullist premier and president Georges Pompidou. At first he was the premier's adviser, and later he became Pompidou's deputy chief and then chief of staff at the Presidential (Elysee) Palace. After the death of Pompidou and a brief spell as a businessman, Balladur became a sort of "gray eminence" for Jacques Chirac, who had become the Gaullists' leader. Balladur officially entered politics only in 1986, when he became minister of finance in Chirac's cohabitation cabinet. In that capacity between 1986 and 1988 Balladur embarked upon a major program of privatization of state-owned industries. While he left that task unfinished after a Socialist electoral victory in 1988, he reprised it immediately upon becoming premier. While Balladur maintained a considerable degree of popularity in the few months after his appointment, he faced a number of serious and diverse crises. First of all, he was compelled to retreat to some extent from his pledge to keep a strong French franc. Tied to an intra-European monetary system, the franc had difficulty in maintaining its value vis-a-vis the German mark. The German central bank (Bundes-bank) in turn kept interest rates high to defeat possible inflation within Germany. In order to keep a strong franc the French had to keep interest rates high as well, or capital would fly to Germany. High interest rates in turn helped deepen the recession. After Balladur's appointment, speculation against the franc began, in the expectation that interest rates would be lowered and/or the French currency devalued. Balladur then opted for a massive currency-rescue operation by the Bank of France, coupled with a small devaluation vis-Ã -vis the mark. While this was a risky course, it did help stop the speculators, at least for a time. Another thorny issue for Balladur was the General Agreements on Tariffs and Trade (GATT). While the United States (and most European countries) preferred lower agricultural tariffs, France insisted on protection of French farmers from foreign competition. Militant French farmers periodically engaged in violent protests in order to keep the government on its protectionist course. At the same time, several French motion picture industry personalities campaigned to limit the number of American films shown in French theaters. After months of difficult negotiations, in December 1993 the Balladur government managed to settle for a compromise with the United States that left many French farmers and cinema personalities unhappy. One more difficult episode involved the attempt to streamline the administration of state-owned Air France. When 4,000 job cuts at the airline were announced, Air France personnel went on strike. Since the French public, worried about unemployment, sided solidly with the Air France employees, the Balladur government chose to retreat. Balladur feared the strikes might spread to other sectors, and his problems worsened throughout 1994. French leftists protested Balladur's policy to increase government funding to private schools. Rioting fishermen demanded government price guarantees. Students took to the streets in contempt of expansion of the welfare state. Despite these problems Balladur remained surprisingly popular, and he sought the French presidency in the election of 1995. Near the end of 1994, shortly before the first round of voting was scheduled (in April of 1995), Balladur and his administration were plagued by a series of scandals. The prime minister's popularity plunged desperately amid charges of illegal wiretapping, kickbacks to magistrates, and financial scandals involving various cabinet ministers. Jacques Chirac, an old friend and colleague of Balladur, ultimately won the presidency, but the friendship between the two was dissolved in the contest, and Balladur disappeared from from the public spotlight. 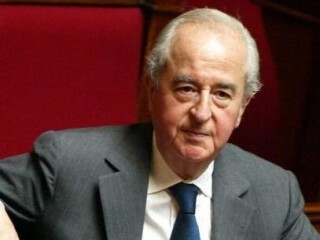 View the full website biography of Edouard Balladur.